SMARDy Pants: Con It Get Any Better? Con It Get Any Better? Okay, so we have a lot to cover and I'm not sure how much we can get to. Writing a blog is tough business and I don't keep up to date like I should. And after all of the amazing things that happened last week, we thought it would be best to finally create a Smardypants Instagram, something we'd thought about doing for awhile. So, in the long stints between updates here, you can keep up-to-date in the most modern-est form of social conveyance by following @smardypantsnate on Instagram. We were given a trip to San Diego Comic Con and we have A LOT of pictures. We have so many pictures that if we uploaded them at once, it would clog the internet like a kink in garden hose. It would bulge and strain until finally exploding, covering everyone in random internet. To save you from that, I'm splitting this entry into two posts. This is about the reason we were there. Next post will be more about our experience at the best nerd gathering since the British Royal Society had their first meeting. This is the image that MARK HAMILL shared on Instagram. It's a uniquely awesome goal. I can't speak for all kids in chairs but Nate does't like being in his chair. It's a grim necessity for him. But once he had his costume...he wanted to be in it as much as he could. Watch this video from Magic Wheelchair about the reveal of the costumes and try not to feel better about the world. But that isn't even the best part. The best part about for Nate is that it made him feel like he was a Jedi. 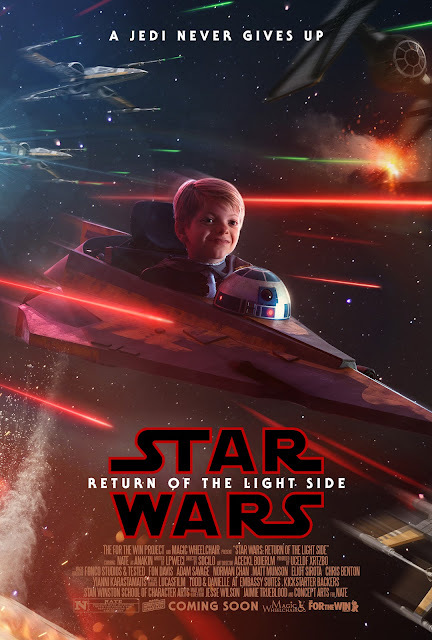 It made him feel cool and happy, like he could take on the whole Empire by himself. He goes from driving a chair to, in his words, piloting a starfighter. We felt like people treated Nate the way we see him. Not with pity or sadness but just treating him like the awesome 8 year old he is. The whole experience was just SO positive. 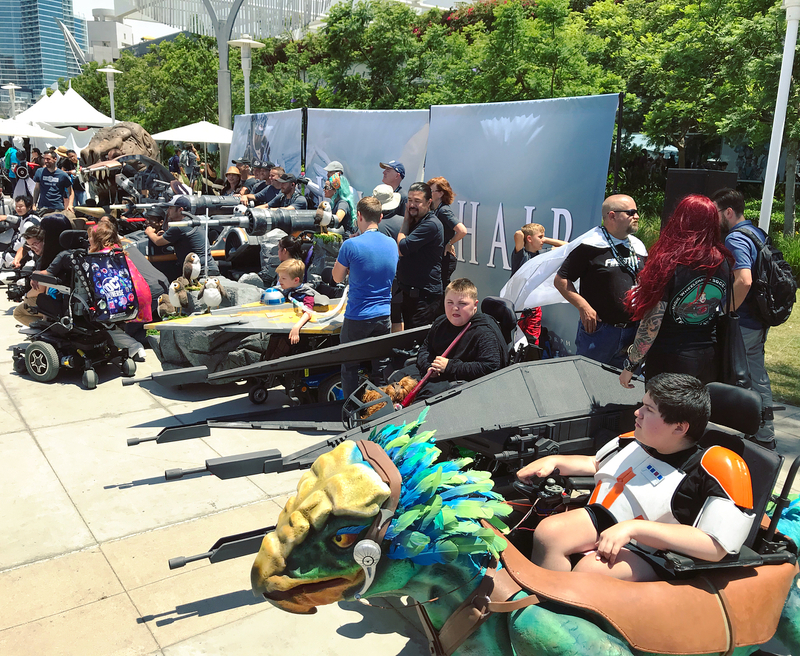 This year, Magic Wheelchair chose seven kids who received a trip to Comic Con where they would be given a wheelchair costume. When Saturday came, it was the hottest day of the week and the crowd waiting to see the kids and their costumes was BIG. The noise and the heat put Nate a little on edge but he was excited. 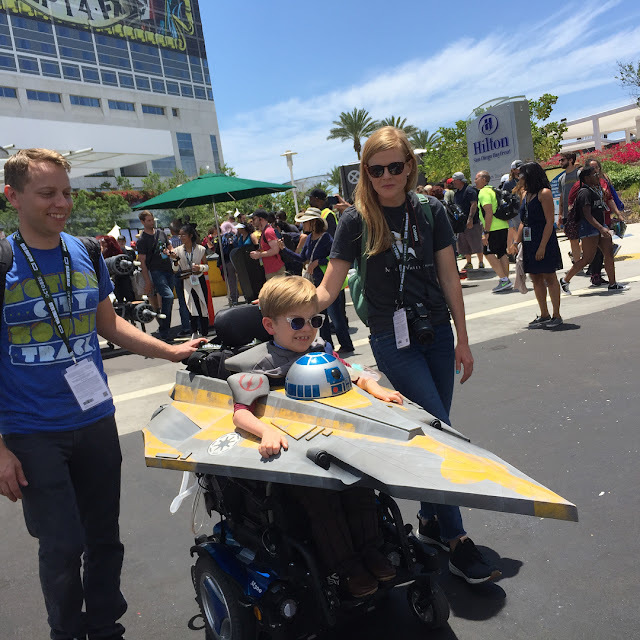 Nate had two teams work on his wheelchair costume. One was the team of Fon Davis, an incredibly talented group of artists led by Fon, a Big Deal in the effects industry. The other team was the team from tested.com and lead by one of the few celebrities I would ever care to meet, Adam Savage. Eventually, they lifted the drape and revealed Nate's costume, Anakin Skywalker's Jedi Starfighter. And not just any starfighter, but the one from Clone Wars. Nate loves the show so this made him really excited. 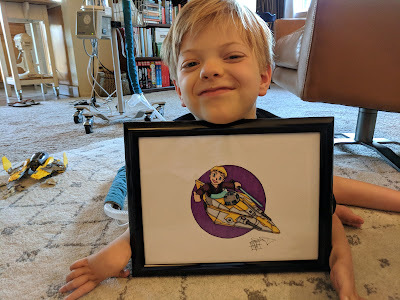 When he saw it he shouted, "THIS IS AWESOME!!" Of course Nate shouting isn't very loud, unless your in an 8 car ride together, so it's hard to hear. Hopefully the build team heard it. Nate with his Anakin mask on taking a few zzzzzs while we fitted his chair. It took a bit to get him settled in it but once he was in, he didn't want to leave. The people that worked on his costume did a fantastic and thoughtful job. It blows my mind to think that this many people took time out of their very busy schedules to build these chairs to make these kids' lives that much better. On top of that, each child was given a really cool hand-drawn logo. But that wasn't the end of it. Oh no. 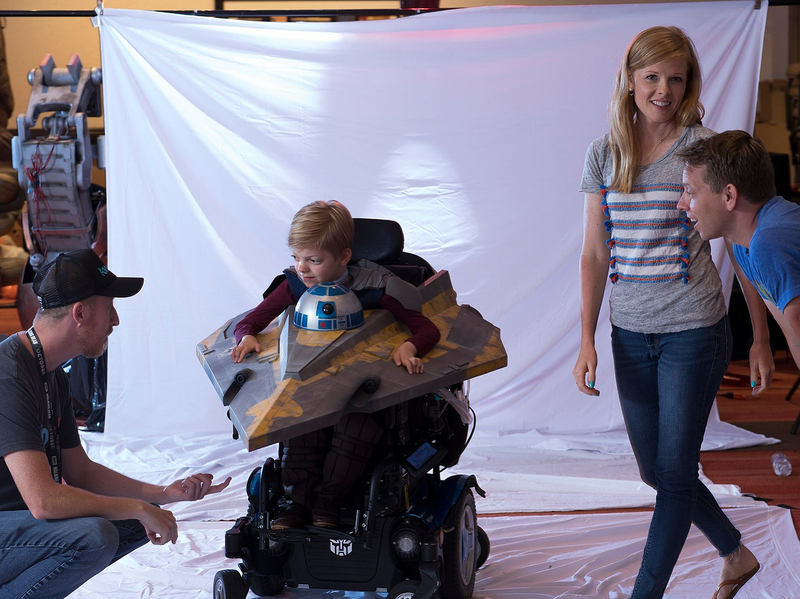 The Magic Wheelchair people worked tirelessly the whole weekend to make sure the kids had an amazing experience. Next up, a parade across Comic Con. If the costume made Nate feel like a Jedi, the parade made him feel like a rock star. All the chairs lined up and paraded across the front of the convention and it was great. Everyone parted to let them through and then clapped and cheered as they went by. I don't know how it made the other kids feel but it made me, Annie and Nate feel so happy and grateful. Finally, it was all done...oh wait, except it wasn't. 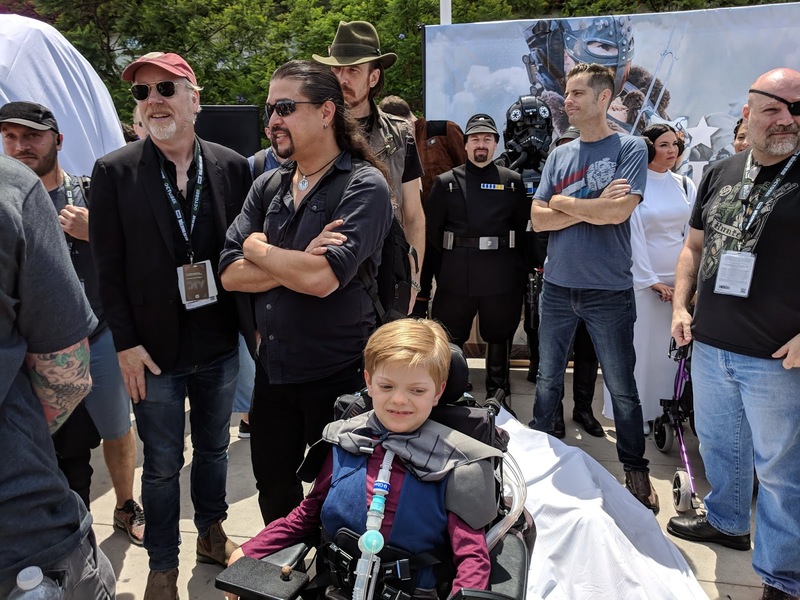 Magic Wheelchair partnered up with another cool organization called For The Win Project that takes kids and puts them in their own movie posters and movie trailers. All seven of the kids were going to be given their own movie posters. He LOVED it. Nate loves to make movie trailers and direct his own short movies with his toys. So you can imagine how awesome he thought it was to be turned into a Jedi and made into the star of his own Star Wars movie. He grinned from ear to ear when it was revealed. 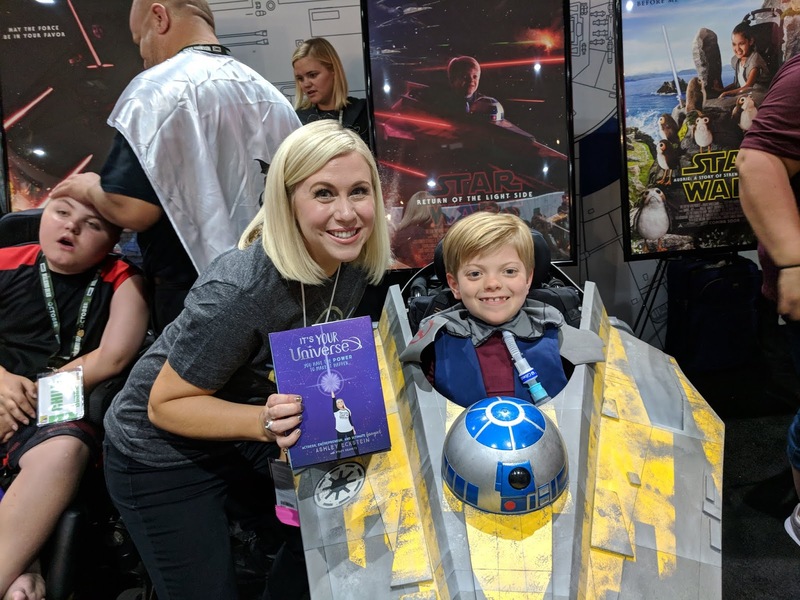 And it didn't hurt that Nate's poster was revealed by Ashley Eckstein. Ashley is the voice actor behind the fan favorite Star Wars character Ashoka from the Clone Wars tv show. I can't say enough about how amazing this all was. Really, I could type endlessly about how amazing an experience it was. But that would be boring. So I won't. Or will I? But I will say this; I am completely inadequate as a father for Nate. My short comings are many (and varied) and I don't have what it takes to provide him with the life he deserves. But there are incredibly talented and generous people out there, willing to give up their time and energy to help pick up the slack. 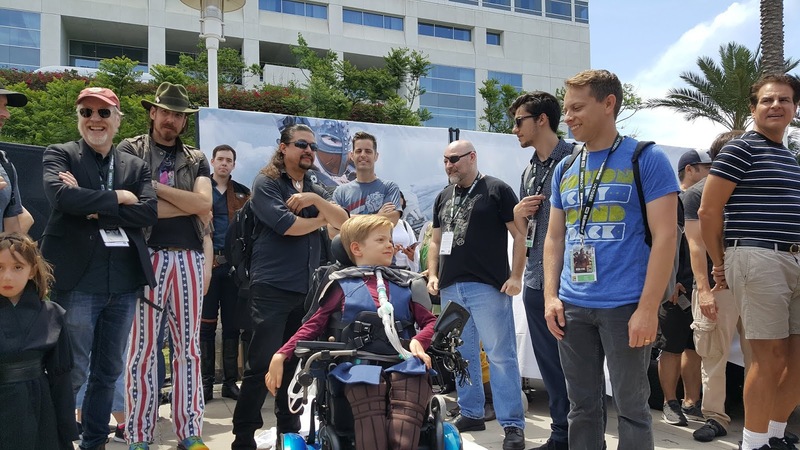 Magic Wheelchair and For The Win Project helped pick up that slack this past week and made Nate's life better. And did I mention that I met Adam Savage? Because I did and I'm sure he totally didn't notice how awkward I was. Nate is a happy little seven-year-old who has a rare genetic disease called Spinal Muscular Atrophy with Respiratory Distress (SMARD). 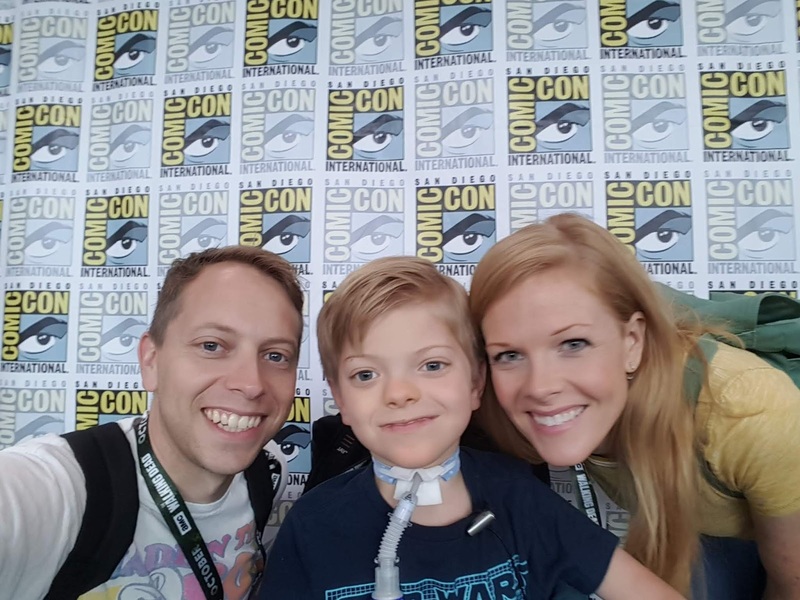 Click here to see Nate's story in pictures.